How will you impact the Kingdom today? You may have heard us use the phrase Kingdom Cause. Just to give you an idea of what that means to us here at Casas, Todd from Bachelor Creek Church of Christ in Indiana shares about his work in Guatemala putting on midwife clinics. I am retired after 20+ years as a Career Firefighter/Paramedic. I now work as a Critical Care Flight Paramedic on a medical helicopter. How many CpC builds have you been on? I have been on five builds with Casas por Cristo in Guatemala with Bachelor Creek Church of Christ from Wabash, IN. How did you think of the idea to start a midwife clinic? After our first Guatemala build in 2014, I had the chance to attend CHE (Community Health Evangelism) training in Indianapolis. During the course, I met two ladies with a similar passion to serve God in a medical way. Throughout the training, I felt moved to return to San Raymundo to meet with local doctors and pastors to see what problem we could have an impact for Christ in their community. The lack of training for midwives was at the top of the list for both parties. Through our work with Morning Glory School, we were able to arrange meetings with some of the local midwives. We also attended the Government Health Clinics monthly training in San Ray to begin to form a relationship with them. The clinics do not deliver babies. 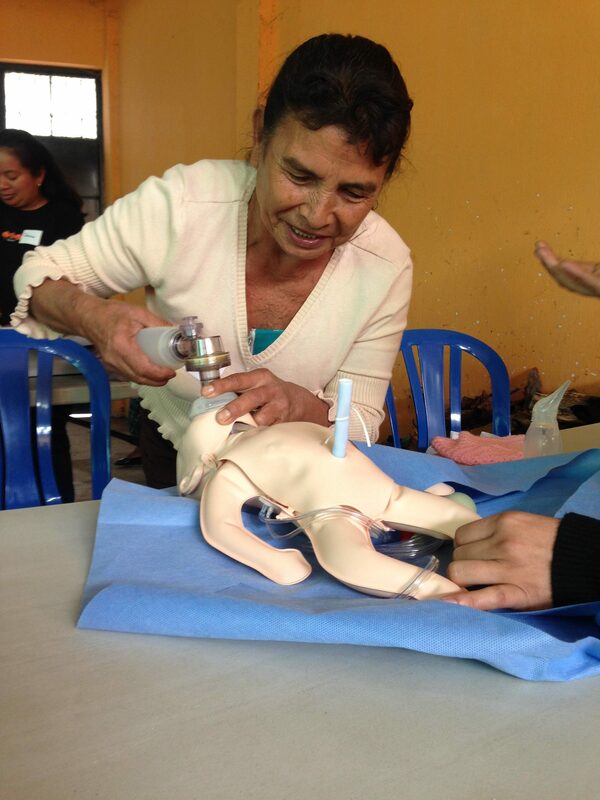 In the rural areas of Guatemala, up to 80% of babies are delivered by midwives. 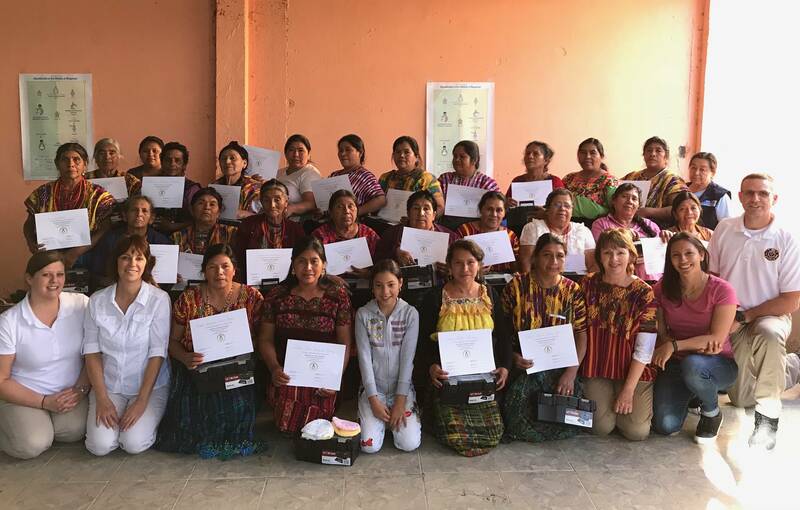 We felt that the best way to move forward would be to work alongside the Government clinic, that way they could continue to practice what we would be teaching during their monthly meetings. The CIA World Facebook states that the infant mortality rate in Guatemala is 21.3 deaths/1,000 live births and the maternal mortality rate is 88 deaths / 100,000 live births. As a comparison, infant mortality in the U.S. is 5.8 deaths/1,000 live births and maternal mortality of 14 deaths/ 100,000 live births. We have been training midwives for 3 years. We have taught in San Ray and in San Juan Sac. In total, we have trained 125 midwives. Each of these trips has been a combined team of 3 to 4 trainers from Bachelor Creek Church of Christ and First Christian Church of Greensburg. The trainers are made up of both paramedics and nurses. What topics do you typically cover in these clinics? We teach three different programs that are spaced approximately six months apart. This is done intentionally so we can return and hear directly from them how they have changed their practices after each training. We also refresh them on the previous training to make sure they are still able to perform the skills they have previously learned. Helping Babies Breathe is the initial course they receive. It focuses on the first minute of life after birth. They learn best practices on how to resuscitate babies that may have difficulties immediately after birth. It is a two-day course and upon graduation, they receive their diploma along with a delivery kit that includes all the equipment they trained on during the course. An infant Ambu bag, bulb suction, hand sanitizer, hats for baby, one-minute sand timer, gloves, and a laminated flow chart in Spanish that includes pictures. The second course we teach is Helping Mothers Survive/Bleeding After Birth. This course now turns their focus to mom as postpartum bleeding is a leading cause of death during childbearing in Central America. We train on the best practices to control hemorrhage while still caring for the baby. We also cover specific complications that are unique to the type of delivery positions that the mothers deliver in. Upon graduation, they receive their diploma along with additional hats for the babies and a laminated flowchart covering this training. The third course is Essential Care for Every Baby and Small Babies. This training now turns their attention back to the baby and the care that may be needed over the course of the next 4+ hours. We train them in how to best manage babies that have trouble with body temperature regulation, nursing, and how to train the parents to care for the baby. We teach them to use thermometers and the babies weight to guide in their decision making. Upon graduation, they receive their diploma along with four thermometers, baby hats, and a laminated flow guide that they used during the training. The most important thing we emphasize during every training is that they can be the missionaries of Guatemala and share Christ’s love and word with the mothers as they care for them during their pregnancy. The training and tools we equip them with during the training are only part of the equation. God is the most important part, and we hope to share Christ’s love in these communities to bring more souls into Heaven. What response have you had from the community as a result? We have had an amazingly positive response from the midwives, pastors, and the local government health clinic. We have had midwives tell us stories of babies they have delivered after receiving the training that would not have survived previously. They have used their suction devices and Ambu bag many times to get babies breathing that didn’t immediately after birth. A problem that we have identified is that they are bringing up incidents of the cord being around the babies neck very often. Since many mothers deliver in a squatting position with the midwife behind them, the cord around the neck is not caught until late in the delivery process. This leads to infant asphyxia requiring resuscitation where it previously meant death. Is there anything we can be praying for specifically in regards to this ministry? Our hope and prayer is that this training is used by the midwives to not only bring babies into the world that are healthy but that they embrace the opportunity to witness and share Christ with the mothers and families while they care for them. We also know that the midwives are under a spiritual attack by being asked to perform abortions, which are illegal in Guatemala. We speak to them using God’s word to encourage them to continue to say NO and not perform these. We have seen groups of midwives split over this topic. Are there any particular stories you’d like to share? We have two midwives from San Juan Sac that have recorded their stories through an interpreter from Morning Glory of how they saved babies that were not breathing at birth just a few months after receiving their initial training. Our midwives in San Ray have several stories also of using the equipment and skills to save babies that would have died prior to the training. We just don’t have them recorded yet. The doctor at the San Ray clinic and nursing staff have both told us that they have seen a great change in the health of babies at birth and the ability of their midwives. This is a perfect example of Kingdom Cause. Throughout the building process, the families, pastors, and volunteers all have opportunities to serve each other. Our hope is that these experiences inspire you so deeply that when you return home to your regular day-to-day routines, whatever that may look like, you may be open and willing to see the innumerable opportunities God presents us with to serve Him by serving others. We all can have a Kingdom impact no matter where we are in the world with the skills and tools that God has provided each and every one of us. So the question is, how will you impact the Kingdom today?